This soap recipe uses luxury butters like cocoa and shea along with castor oil to create a fantastic soap bar with a rich, creamy, bubbly lather. Carrot infused olive oil, kaolin clay and titanium dioxide lend this soap it's wonderful buttery colour. Scented lightly with a grapefruit essential oil blend, this is a great soap to make for everyday use. To make this soap recipe palm free, increase the amount of Shea butter to 20% and omit the palm oil. Be sure to run the recipe through a lye calculator to get the new amount of lye needed. Lye - 123.5 gr. | 4.36 oz. Infuse the olive oil. Finely grate a carrot and add it to approximately 300 grams of olive oil and heat gently. Leave overnight to cool and strain the next day. Prepare your soap ribbons and soap mould. Mix the titanium dioxide and kaolin clay with a small amount of the olive oil, blend well and put in a ramekin. 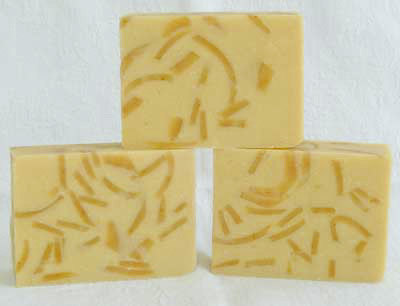 Follow the instructions on the 'How to make soap' page to make this homemade soap. Once the soap reaches a thin trace, add in the titanium/kaolin mixture and then the scent blend. Mix well and gently add the soap ribbons. The soap should be at a medium to thick trace by now so pour it into the soap mould and insulate it using your usual method.